A Kentucky woman was arrested this week on charges related to crystal meth while wearing a shirt that reads "I (heart) Crystal Meth". 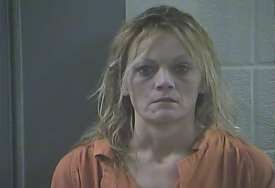 Debra Delane Asher, 37, of Somerset was busted by the Laurel County Sheriff's Office and charged with trafficking in a controlled substance (more than two grams of meth) and is also being held as a fugitive from another state, according to jail records. She is being held on a $25,000 bond for each of those charges. The sheriff's office shared a photo of Asher on its Facebook page, and from there the story was picked up by local media and then national outlets like Mashable and The New York Post.